I’ve checked my WordPress stats!! Not very many folks come to peek at my blog. I’m ok with that for now. 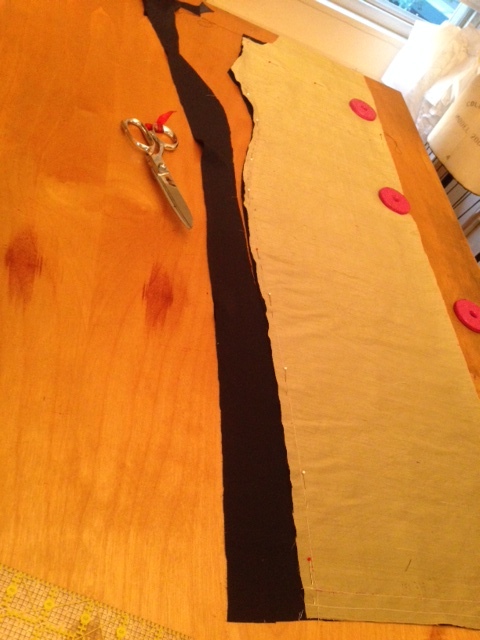 Am I trying to become the next “big thing” in sewing? Not really. You are only as good as the last thing you have sewn and posted. In addition peoples’ attention spans are pretty short, and they are always looking for the next “NEW” thing you’ve sewn. 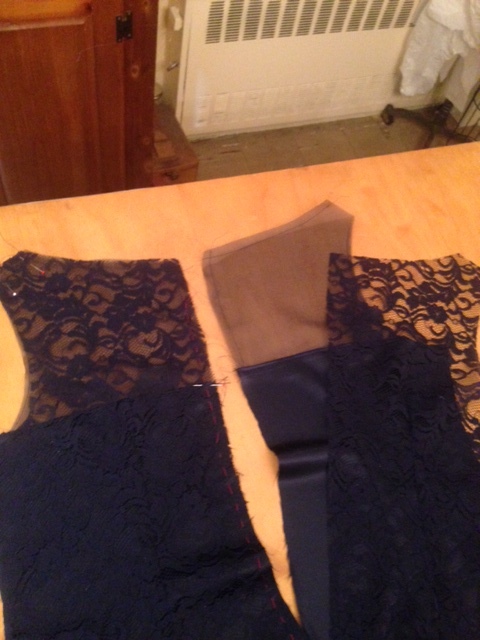 For me– I like to take my time making clothes. I can’t do “skirt-a-day”, “dress-a-week”, sadly not even “garment-a-month”. 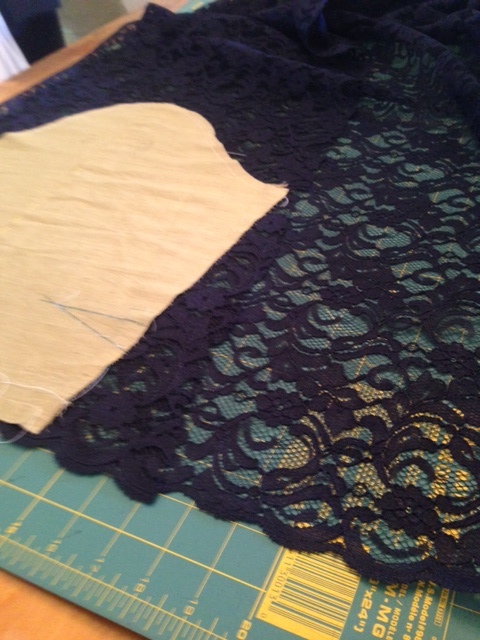 Like most folks, my life is more than sewing. And it can be exhausting trying to sew and compete for blog attention. I think you knew that! Anyway… I am going to take the opportunity that I have, with no one looking, to show Cindy and Rosie what I made ( since I think they are two of the only four people who peeked at this blog in the week…). So — Rosie introduced me to Robyn, who introduced me to a friend of a friend. I made a dress for the Friend to wear to an upcoming special family event. I am showing it off because the dress is one of my favorite colors and I am very happy with how the lace neckline turned out. 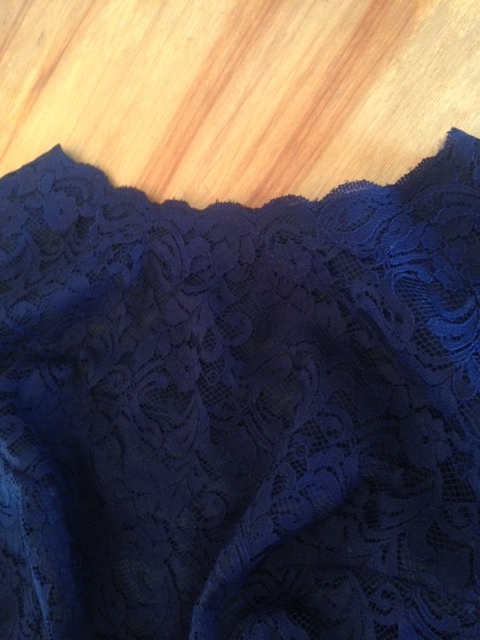 It’s Midnight Blue lace from neck- to- knees. 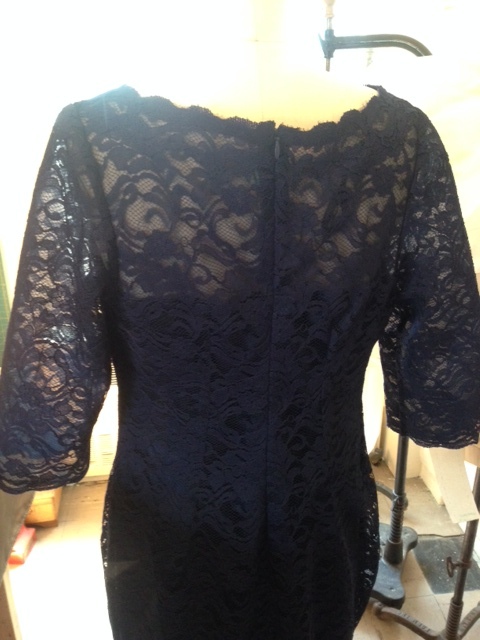 The lace is an overlay dress upon a matching midnight blue silk organza and silk crepe dress. 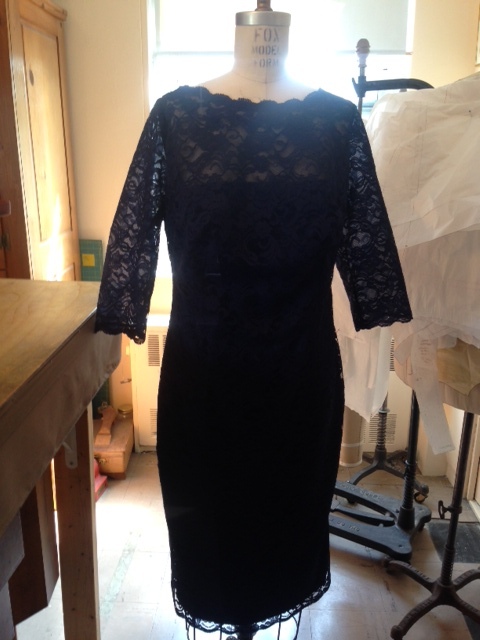 The dress is lined in black silk charmeuse- just for a little change from all the blue. 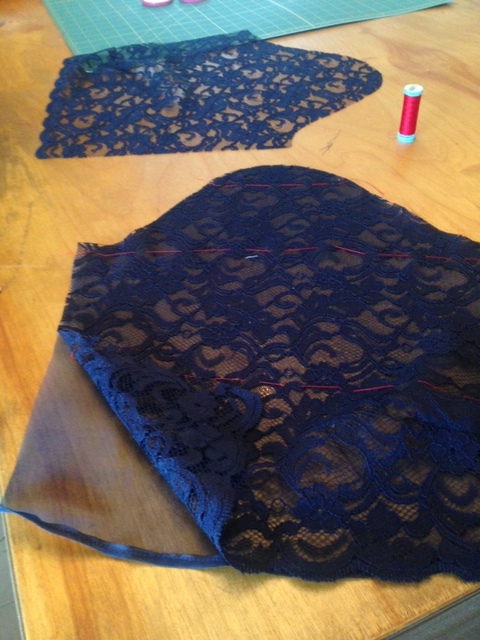 What I enjoyed the most was cutting the flat lace edging from the goods and doing the “old couture school” hand sewing in shaping the lace to form the circular neckline. 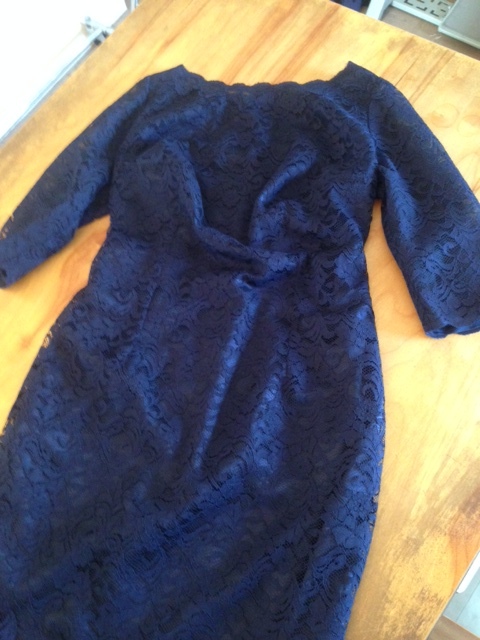 I used a technique that Susan Khalje uses all the time to support the neckline with black “Hug Snug” seam binding tape. 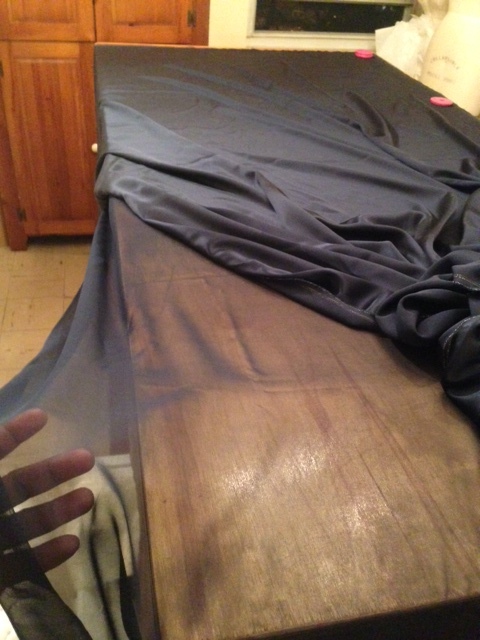 I was grateful to find and to underline the lace with the silk organza that matched perfectly so that I could keep the dress sheer at the chest area and sleeves. Unfortunately the Friend was in the process of moving out of state and needed the dress quickly, so I could not do ALL the couture touches that I wanted to do within the lace to eliminate the seams at the bust and “fish eye” darts and the side seams, but those seams and darts are hidden in the beauty of the lace, and I am happy with the results. Seemingly- the Friend was happy as well. My goal was to make the Friend look like “arm candy” as she enters the room on her husband’s arm on that special day. I hope she sends me a picture of herself in the dress on that day to prove it so! Lastly- I thought I would show you two gals what I did with my sewing space. Changed it up since I returned from Berlin this past May. Cindy has seen it, and maybe Rosie doesn’t really care, but I was inspired by Oonaballoona who recently posted her sewing space. I figured- what the heck? Only good friends looking anyway. See you gals soon! Sharon, what a lovely dress!! I am sure Robyn’s friend will look wonderful! Like you, I am one of those people who don’t sew a garment a day or week and don’t feel the need to! I promise I will see you soon and yes biatch I do care about your sewing space. And yes, I did go there on your blog :-). Much love!!! fyi: There may be views to your blog that don’t get counted. For example, I follow your blog through a RSS feeder (NewsFire). Your posts are fully visible there, and rarely do I have to go to your website. I just added this blog to my RSS reader. Good to know more than just Cindy and Rosie see my blog! THANKS for the info about the RSS feeder. Thanks for all the love!! Are you on Twitter? Do you have a Facebook page? Those things probably help. 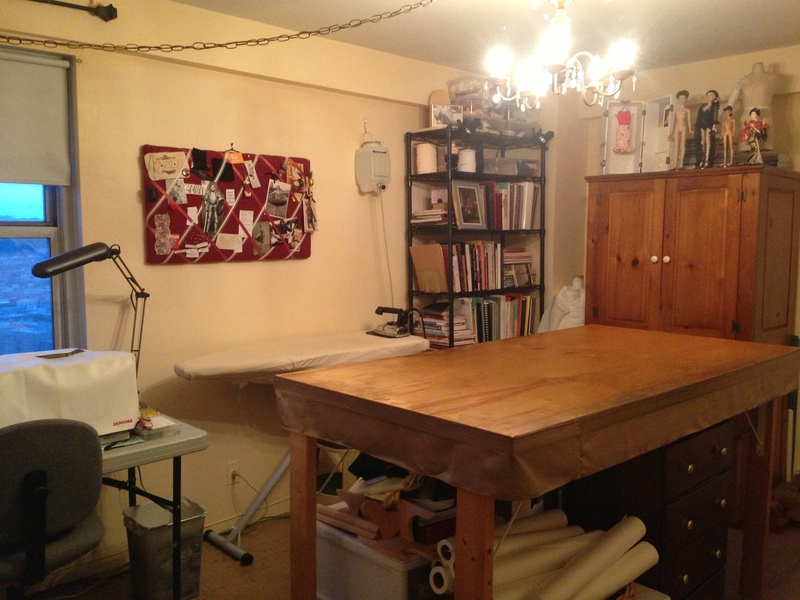 I envy you your sewing space. Beautiful dress, btw.